Putters and AstroTurf are back in a big way with this game which features two nine-hole courses. Golfers encounter environmental hazards, pesky insects, and worst of all: other competition! You can connect with up to four players for an intense battle. Choosing between two paths is common, but be careful - a wrong move could sink your ball into a pit of lava or onto a slippery ice patch! With two different styles of putting to choose from, EasyPutt for one-click putting, or TruePutt, which lets players control the force and angle of the putt, it can be played by novices and MiniGolf masters alike. 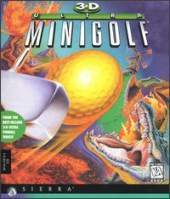 Each hole offers a different theme, from a moon base to jungle ruins. Avoid hazards on each hole that can destroy your ball.